“Important work like sittin’ around fishin’ remains to be done.” In making this quaint observation, Pogo was not the first to recognize the importance of being alone and idle. The value of solitude has been affirmed throughout history. “In the morning, — solitude;” said Pythagoras; that Nature may speak to the imagination, as she does never in company . . . ‘Tis very certain that Plato, Plotinus, Archimedes, Hermes, Newton, Milton, Wordsworth, did not live in a crowd, but [in solitude, and] descended into [the crowd] from time to time as benefactors: and the wise instructor will press this point of securing to the young soul in the disposition of time and the arrangements of living, periods and habits of solitude. And stare as long as sheep or cows. . . .
And watch her feet, how they can dance. . . .
We all need a rhythm of life that includes times of idle solitude, in which to think and reflect and consider from a distance the lives we live daily. We need spaces of silence between the notes so we can hear the music of a greater life that whispers through creation. Like the poet William Alexander Percy (“Home,” In April Once [New Haven: Yale University Press, 1920], 72-73), I know . . .
Too much is said too loudly; I am dazed. Is lost in voices shouting to be heard. I once knew men as earnest and less shrill. These minds that gain all knowledge but no calm. We live such overactive, hyperconnected lives these days, we rarely carve out even a few minutes for solitude and contemplation. We constantly check our email; we swim among dozens, even hundreds, of text messages daily; we scroll endlessly through the social media to stay in touch with relatives and friends and casual acquaintances and even people we have no business knowing. Our individual, uniquely gifted lives are swept up and lost in the crowd. And faith, unwise, unquestioned, but a star. Even Jesus struggled as we do. He had barely begun his ministry when Mark tells us “the whole city” gathered at the place where he was staying so he could cure their diseases and cast out their demons (Mark 1:32-34). And he did just that. How easy it would have been for him to be swept up in the power he had, to be carried away by the adulation of the crowd, to be seduced by the ego satisfaction of doing so much good for so many people. But early the next morning he “went out to a deserted place” (v. 35), he retreated to a place of solitude and silence. And I think he reflected there on all the demands that were being placed on his life, on all the claims that were being laid on his time, on all the directions in which his life was being pulled. And in that reflective solitude he heard again God’s call on his life, and he regained his sense of purpose. When his friends found him, they reminded him of all the things others wanted him to do for their lives. “Everyone is searching for you,” they said (v. 37), all these “voices [are] shouting to be heard” (Percy). But by then it was too late. Jesus had heard again the one compelling voice that laid the ultimate claim on his life, he had remembered his true vocation, his true calling. “Let us go on to the neighboring towns,” he said, “so that I may proclaim the message there also; for that is what I came out to do” (v. 38). We need periods of solitude and silence in which to hear a voice that suggests where we’re going. It’s a voice St. Paul captured in his letter to the Romans. “Don’t become so well-adjusted to your culture that you fit into it without even thinking,” he wrote. “Instead, fix your attention on God. You’ll be changed from the inside out. Readily recognize what [God] wants from you, and quickly respond to it. Unlike the culture around you, always dragging you down to its level of immaturity, God brings out the best of you, develops well-formed maturity in you” (Rom. 12:2 The Message). 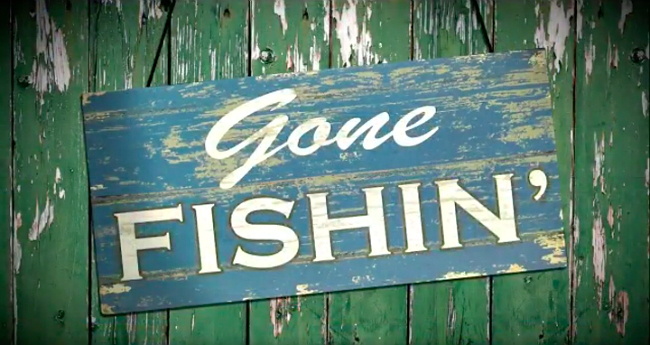 Remember, “Important work like sittin’ around fishin’ remains to be done.” So take some time, starting this day, to go fishing, to go into the cell of solitude, where God will teach you everything.